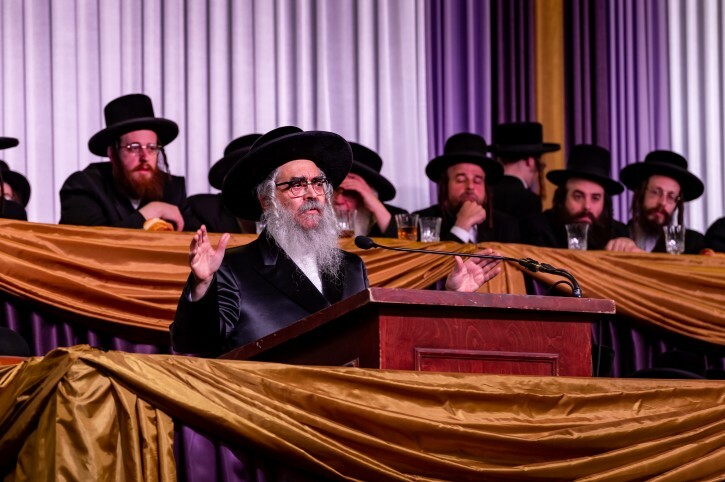 New York - Wednesday night’s cold temperatures were no match for the scorching words of the Satmar Rebbe, Rabbi Aron Teitelbaum, who hurled fireball after fireball at the New York State Department of Education during last night’s 74th annual commemoration of the Satmar Rebbe, Rabbi Yoel Teitelbaum’s escape from the Nazi regime. The massive gathering was held at a warehouse in East Williamsburg and Rabbi Teitelbaum spared no words in his approximately 60 minute long address to the crowd, blasting Commissioner MaryEllen Elia for directives issued this week giving public schools the authority to decide if yeshivos were meeting the state mandated guidelines for providing a substantially equivalent secular education, as previously reported on VIN News (http://bit.ly/2TVRaEL). Speaking passionately throughout the entire address, the Satmar Rebbe gave clear instructions to his followers to defy the DOE’s new orders, noting that the yeshiva system’s successes far outweigh those of the public schools and that the state has no right to intervene in the constitutionally guaranteed right to freedom of religion. “If the commissioner of education wants to fix education in the State of New York, he can go to the public schools and fix the education being offered there,” thundered Rabbi Teitelbaum. Blazing ahead in a similar vein, the Satmar Rebbe said that the success of the yeshiva system has been historically proven. Drawing parallels to the upcoming holiday of Chanukah, the Satmar Rebbe said that the unthinkable had happened with Commissioner Elia following in the ways of the Greeks who issued decrees prohibiting Jewish education. Rabbi Teitelbaum took the holiday theme one step further, taking aim at newly elected State Senator James Skoufis who blasted Kiryas Joel in his victory speech earlier this month. Without mentioning him directly by name, the Satmar Rebbe described Skoufis as a “wicked and evil man,” the biblical description accorded to Haman in the story of Purim. Calling for unity among all Jewish groups in the face of the DOE rulings, Rabbi Teitelbaum said that the time had come to put aside small differences in order to achieve a common goal. I am not in much disagreement with much of what R' Teitelbaum said. But I remain appalled at the role that political issues has taken. I would have expected that the gathering of so many thousands of Yidden at a chassidishe tish to commemorate the tzaaddik would have been focused on imparting messages about how to strengthen our avodas Hashem. The campaign about education might well have merit, but the microphone at a tish is not the venue to pursue this. To Rabbi Teitelbaum, we don't think the great and Holly Rabbi of Satmar the Divreh Yoel appreciates your speech on this matter and also trashing elected officials as you have done in front of thousands of members of your community. You have acted the same manner as the Zionist regime in Israel, except you were supposed to be different and are being HISGARO BEIMOS. We are living in a land of liberty and piece, therefore if we Jewish people have any problems with laws that effect our ways and religion, we were thought by the great Rabbi Yoel of Satmar Z"TL to do it in a peaceful way and not acting as you are running the world . You have made the biggest Chilul Hasem of the century. We ask from you to apologize to the official you trashed in a unJewish manner. As far as the education problem you always can sit down with the authorities and explain to them where we find it unlawful of them mixing in our education. You don't have to bash their education for that purpose. The Rebbe Sliteh forgot to mention that app. 80% of his follower in Wili and BP are on Welfare,Section8,Food Stamp, Medicaid etc. I met the Rebbe a couple time and have no issues with him. However, I am curious, did he mention in his speech that "The Hasidic Village Kiryas Joel Poorest municipality In US"? What does he make of that? Also, How can one compare a population 100 times (at least) bigger to another? Tens of thousands of Torah observant Jews thank the almighty for this day. The rescue of the Satmar Rebbe is the rescue of the entire Klal Yisroel! The Satmar Rebbe brought to America and to worldwide Jewry authentic Judaism.To follow the Torah as we always did without any negotiations.Tens of thousands of Jews even those who wont admit are real Frum becuase of his influence. We would of been American Jews and because of him we are Jews who live in America. The Rebbe lectured about the danger of Zionism and how having a Jewish state before the coming of Moshiach is the biggest sin its a rebellion against Hashem just as the the golden calf. His opinion was just as all real previous Gedolim had. The Satmar Rebbe was an example in Mitzvos sh'bein Adam Lechavero.Giving Tzedakah and Bikur Cholim to any jew no matter if that Jew was his Chassid or enemy,Zionist or not. The biggest Tzedakah is given today by worldwide Satmar Chasidim. Plenty of frum people fill the white collar, low security jails. for financial crimes.The rebbe also failed to mention the high use of section 8, food stamps, medicaid etc. among the chassidish. He was rescued on the train that was called the Kastner transport.Thanks to concerned Jews who paid the Nazis a huge sum. Documents show that if not for the Satmar Rebbe this transport would of gotten to Auschwitz. The idea that the Nazis can be bought with money was the brainstorm of the great Tzadik Rabbi Weissmandl and he passed it on to the Orthodox Kehila in Budapest. The Zionist activist found out so they maneuvered to take over the negotiations. Eichman YM'S writes that he loved dealing with Kastner he was an ice cold person. The Rebbe was a staunch anti Zionist and he was the last person they wanted on the train.The Zionist establishment in Hungary hated the Rebbe as much as the Nazis hated the Jews in general. The news article is just a sample of the powerful speech the Rebbe gave. It leaves out much, including his clear explanation of the issues regarding education, how he sees Yeshivah educations fulfilling the of the "secular" education guidelines. It also leaves out his "call to arms" for political and legal opposition to the new education directives and enforcement, to use political influence with the Democrats who "run the State of New York" and most of all, to create an alliance with other Jewish groups to present a more unified political force. Will it happen? We will see. "The Zionist establishment in Hungary hated the Rebbe as much as the Nazis hated the Jews in general." What could,be more avodas hashem then the chinuch of our children, the guarantors of the Torah? Never thought I would be saying this about the Satmar Rebbe: He's right and good on him and more power to him. The public school system has failed big time and the govt is no position to preach to others on how to educate. Please remember, dear commentators, that Germany was the most civlized, highest educated, most sophisticated society of all time, and they produced the Holocaust. We Jews have been around for 3,500 years not because of secular education, but despite it. The Satmar Rebbe is right to invoke Chanukah, when there was a huge push towards Hellinization by other Jews, not only the Greek-Syrian Govt. As much as I disagree with Satmar on just about everything, I do admire this move by the Rebbe on his bid for religious freedom for his community. More power to him. Neither Zionism nor anti-Zionism is responsible for the existence of Klal Yisroel today. Proclaiming either one is laughable. Regardless of which opinion you believe, the ultimate kiyum of Klal Yisroel today is the adherence to Torah and mitzvos. Yes, the chesed exemplified by Satmar chassidim is a large piece, but this is, by dictate of the Satmar Rov ZT"L himself, independent of the anti-Zionist shittah. The abandonment of the focus on being better Yidden, better Ovdei Hashem, better baalei chesed is a sinful direction for asifos and tishen. That is as much the work of the Yetzer Horah as the medina (as per the Satmar Rov's shittah). We are getting bogged down in trivia. We have many hundreds of kids today leaving shmiras Torah and mitzvos, marriages crumbling, yeshivos throwing kids out onto the street, but we are obsessed with Zionism. This is a breach of our Naaseh Venishmah affirmation. How silly, childish, and destructive. I love this liberal comments section. Also to all those saying so many people get food stamps etc... 1 please find a source to back up your claim 2 - we do not get the 25k per child everyone else gets, so even if we have a slightly higher percentage in benefits, we still come up short handed. The top 10 place in the us for food stamps use are McCallen Tx, Laredo Tx, Grants Pass Or. Rocky Mt. NC, Hammond La, Albany Ga, Brownsville Tx, Vaslia Ca., Longview Wa. and Merced Ca, places that have never seen a Chosid, You really need to seek some profesional help to deal with your self hate. “ Never thought I would be saying this about the Satmar Rebbe: He's right and good on him and more power to him. So far the best comment here. "Germany was the most civlized, highest educated, most sophisticated society of all time, and they produced the Holocaust." All you haters should hang your head and Shame. You comentators always find something to criticize about. But this but that...... These are true words spoken. You have no respect for great Torah schollars. You all aught to ask the Rebbe before mechila, at least sometime before Rosh Hashana!! It's people like you who are the ones that destroy the chosen people. The Ayatollah has spoken! Sorry, but that is what his diatribe sounds like. There is no reason all children are not provided with an adequate secular education in the 21st century. Anything less is child abuse. I don't know, but when I look around, all I see is chassidhe kids who have no interest in being chassidish. Enough with this nonsense! You could never do this in Europe. Everyone had a secular education. It is my hope they lose in a big way.
" Documents show that if not for the Satmar Rebbe this transport would of gotten to Auschwitz." Where can we find these documents? I'd like to know; until now, I never knew they existed. "The idea that the Nazis can be bought with money was the brainstorm of the great Tzadik Rabbi Weissmandl and he passed it on to the Orthodox Kehila in Budapest." Bribery, also called "pidyon shevuyim" is far older than Rabbi Weissmandl. Polish Jews tried it in 1942 and got nowhere except the gas chambers. By 1944, when the Hungarian and Slovakian deportations took place, it was obvious that Germany was losing the war. The Nazis Rav Weissmandl dealt with in Slovakia were open to taking bribes. Ditto with Himmler and his henchman Becher. However, Eichmann, who was in charge of the Hungarian deportations could not be bribed. "The Zionist activist found out so they maneuvered to take over the negotiations. Eichman YM'S writes that he loved dealing with Kastner he was an ice cold person." That is how Kastner managed to save 13,000 Jews. Not just those on the train, but the "Jews on Ice" from Debrecin, whom Kastner convinced Eichmann to send to an Austrian labor camp instead of Auschwitz. "The Zionist activist found out so they maneuvered to take over the negotiations." Actually, Rav Weissmandl worked hand in hand with Zionist leader Giselle Fleichman to save the Jews of Slovakia. The whole effort fell apart when the Slovakian resistance broke out and the Nazis came in with full force to fight it. Giselle Fleischman was killed in Auschwitz; Rabbi Weissmandl escaped the train he was on. I just want to point out what I believe is the important issue at hand. Chasidish boys currently in the schools deserve to be given a proper education. They deserve to be taught how to communicate, write, read, etc Their education is currently being neglected with the schools and rabbis shouting "religious freedom". What if they refused modern medical care with the same argument? (just like some cults do) At what point do you say, F### your religious freedom..these kids deserve to be offered basic tools that may help them in the future. You want to expose children to various ideas as they're growing and developing because you never know which one of those ideas will stick with them ..and provide them with a huge advantage in life. Why does the holocaust always have to come up??? My grandparents went to auschwitz too. Hard to comprehend how humans are capable of such evil. But now we're here... and these kids deserve a chance in life and a proper education. Well? 90% of Yiden vote Democrats and therefore they are not REAL Jews. 6-7 Are Chassidim or other Anti Israel Sect. So MR STAMTRUMP when you say that "Real Jews voted Trump" about 2-3% of all jJews. Teanack,NJ 5Town and a small Part of Flatbush?? Correct? Why not state your name? After all, you're probably smarter and wiser than Rabbi Teitelbaum. Many posters refer to NY spending 25G per child on education. This figure is not correct. The 25G is an average including the very high costs per child in special ed. Those kids in Satmar that need special ed still get it at cost to NYC. By the way, there are frum special ed schools and armies of frum therapists and aides. Wouldn't you rather give your taxes to them? You are paying taxes anyway so at least you know where its going. The Rabbi and his followers, and the VIN posters have never set foot in a public school, except maybe to vote. They spew hate and racism. Are those Toira values? Public schools take EVERYONE. I've read on VIN many times how parents go begging from one yeshiva to another and can't get in or can't afford it. And how many graduates can't earn a living or don't want to. What's the excuse? Satmar contribution to America is virtually ZERO. Especially compared to the successes of U.S. public school Jews in every field here. “Wicked and evil” is how the Village of Kiryas Joel’s supreme leader described me to a crowd that numbered in the many thousands last night. I guess he’s still rankled that my campaign was able to easily overcome his bloc vote this past election. Putting aside the abhorrent, disgraceful nature of his comments, these remarks are dangerous. Is Rebbe Teitelbaum trying to elicit violence? Here’s what I do know: I will not be intimidated or bullied as I continue to ensure every community, including Kiryas Joel, follows the law and plays by the same rules. Period. You are really not being honest, are you? You were not educated in Satmar or anywhere like it and have today a college degree. Unless, of course, you graduated about 30-40 years ago. Just be truthful. I actually AGREE with the holy man. Well the Rabbi opened up a can worms by indirectly trashing an elected official, there will be terrible repercussions..
Cut the fake news. Laredo and other border towns have a very high rate of immigrants who don't know English ,and also milk the system for their American -born children. In addition, there are lots of frum people who are too clever to get caught in welfare fraud. As someone in the know, the Rabbi is totally mistaken here, Sen. elect James Skoufis had not been the man to support the education bill, not sure why he mixed linked James in into this. “ " Documents show that if not for the Satmar Rebbe this transport would of gotten to Auschwitz." Where can we find these documents? I'd like to know; until now, I never knew they existed. In the book Moshian Shel Yisroel vol.8 by Solomon Gelbman there is at length the entire rescue from beginning to end.I bet you read it already. “ I just want to point out what I believe is the important issue at hand. Chasidish boys currently in the schools deserve to be given a proper education. They deserve to be taught how to communicate, write, read, etc Their education is currently being neglected with the schools and rabbis shouting "religious freedom". What if they refused modern medical care with the same argument? (just like some cults do) At what point do you say, F### your religious freedom..these kids deserve to be offered basic tools that may help them in the future. You want to expose children to various ideas as they're growing and developing because you never know which one of those ideas will stick with them ..and provide them with a huge advantage in life. What does a proper education mean? Teaching kids how to make the most money or teaching kids to be decent human beings? Having a masters in education and actually having been in public schools, I can share with you that todays education is geared to thinking skills; not to morals or ethics and not to memorize information. The yeshiva system, when run well should be able to teach the same academic skills. Knowing biology, earth science, zoology etc. Etc. is not important for every day living as long as you have the academic skills to learn the information when it is needed. Teaching children to read and write the basics is inherently not a secular subject. Research shows that when a child is properly taught to read and write in one language (whether hebrew, yiddish, english etc. Etc.) They are much better at picking up a second language at a later age and will then know both of those languages better then children who learn two languages at the same time and use neither of them fluently. Reading and writing become a secular subject when they become a means to an end i.e. the focus is on the perfect expressions of grammer and style. They are not a secular subject when used as an end to a means- learned in order to express oneself properly. As a side note: for those making up statistics about people on welfare. Look up publicly availabe data on SNAP usage for congressional districts of 7,8 and 9 in NYC. (Including boro park, crown heights, williamsburg) Even assuming that ALL white people are chasidic, they are still a minority of people on SNAP in districts 8 and 9 and way below the Hispanic and Asian percentage in district 7. In district seven there is a signicficantly larger percentage of hispanics on SNAP then ALL whites (jewish and not). “ Many posters refer to NY spending 25G per child on education. This figure is not correct. The 25G is an average including the very high costs per child in special ed. Those kids in Satmar that need special ed still get it at cost to NYC. Don't you think your experience is substantially different to what is being offered in our schools to today's children. They receive zero secular education. There are many children in Satmar who cannot speak English let alone write it to save their lives. Their parent's do not allow them to read Their kehilla would throw them away if they knew they were reading. You cannot compare your experience to what is happening to today's youth who are being handicapped for no reason at all. Learning secular studies is not a gezeiras shmad. In fact, Reb Yoel permitted it. What is happening in our time is child abuse. And, this rebbe has spewed much venom, not unlike the Ayatollas. Noone is "stealing" your tax dollars. But to call it illegal and bashmutz and slander other jews????? Not becoming of a frum trump supporter. We have to be better than tricky yoni who slams other jews. All this after telling his chassidim too vote democrat in every election. Sorry but it's too late now. I'd like to point out that this happened after the state senate turned all democrat. The Rebbes schools are purposely graduating students,, 99% who cannot speak or write in English and are unable to hold meaningful jobs that can support their families. This keeps their flock unable to access high paying jobs in the public sector. The Rebbe is flaunting the law which says all schools must meet minimum educational standards. Does the Rebbe feel he is above the law? Yet, he and other leaders have no compunction about taking Federal and State money for busing and other needs. The majority of public schools students are literate, can read and write English which is the language of this country, do high math, understand science, history and other basic subjects which are crucial to being a productive citizen of the country they live in the USA. The USA has been welcoming to people of all religions, nationalities. If you object to the laws of this country, either move somewhere else, or stop taking tax dollars, That's what the Amish do. “ What does a proper education mean? Teaching kids how to make the most money or teaching kids to be decent human beings? The pubic school system only failed because of family dynamics and culture. Its not failing because of a lack of education. Go to upper scale communities and you'll find plenty of successful schools. Schools only work in tandem with normal social settings and parents that care. “ I love this liberal comments section. shkoyach From a tax payer perspective you need to compare 2 bread winners. 1) the "goyisha" bread winner earns say 100k, pays taxes, has 2 kids and gets say 50k back from the govt because they go to public school. 2) The hiemisha breadwinner earns 100k, has 8/9 kids, gets medicad for all of them , gets certain school funds, WIC, Snap etc.. He takes back close to 100k. you obviously never read Ben hecht. Not surprising from tricky yoni. I had a family member years ago who taught in satmar. The english principal use to give frosks for misbehaving. they took secular studies very serious? What changed since the 60's?? The Reba zy"a had a serious secular studes. what is wrong with teaching secular studies? Can someone please provide insight? Why not teach 9th graders? yes sensor the material beforehand. But why not secular studies? Is it bittul torah for 9th graders who can't learn a whole day anyhow? So why not secular studies??? "After telling his chassidim to vote democrat" like all Yiden do. Chassidim Liberals, Not Frum etc. app. 96-97 % of Yiden. Its not a secret. Even UNEDUCATED knows this no matter what he posts. "By 2030 30% of children in Brooklyn will be chassidish" keyn yirbu. More votes for Democrats. This is just one more reason we need more immigrants. Some work needs to be done. White Republican trash will not clean/cook etc for 100.000 + children. Satmar started with just app 50 families 65 years ago. The only thing I hope one day they will send a few dozen families to Idaho North Dakota and other Republican Hecktowns to turn them Democrats in a few years. now its too late to speak out. This speech should of been given to help the republicans win the ny assembly. Now is too late unless he will make sure every frum jew votes for Trump 2020 You support the democrats you have to realize they will force you to teach evolutuion and same gender propaganda. Such darkness from both sides of this argument. Be very wary of others reading your words.They may come back to haunt you. Just remember that education is not about what is taught, rather it is about what is learned. It would seem that many have lost focus on what is truly important - tznius both in thought, speech and action. “ shkoyach From a tax payer perspective you need to compare 2 bread winners. If you make 100k a year then you dont qualify for medicaid, fs, wic. Etc. Even with 8 kids. A heimishe breadwinner who is making 100k a year and has 8/9 kids is paying at least 40k in rent/mortage, at least 50k in tuition, at least 10k but probably more for health care and we didnt even count groceries and clothes yet. If you notice those numbers add up to more than 100k. Thats because a heimishe breadwinner making 100k with 8/9 kids is not making enough to survive. They do not sit in jails! And as far as your second comment, so what?? Clearly, you did not read the first half of the comment. What sort of reasoning is this? Jewish school are for some reason supposed to be the last ones held to minimal standards? This is silly. His schools are not teaching children the basic things that everyone should know— math, English, science. As a result, his community lives on handouts. If he wants to denounce the state in passionate speeches, he should have the integrity to stop taking their money. What does “kol hakavod mean, and whatever it means why couldn’t you write it in plain English? I think the point about us not getting the 25k per child is one of the best arguments I have heard in support of people that take advantage of government programs. I personally don't take any if these programs but kudos for an amazing point. The Satmar war against education is an old story. They are worried that if their followers ever do get an education they will be left without followers and the Rebbe and his minions may have to actually work for a living. The greatest tragedy is that the Satmar people actually believe that what they are practicing is real authentic Judaism (it is in fact a grand costume carnival and doesn't even resemble Judaism! ), so when they leave they leave it all. You don’t belong on this site. You seem to be able to discern and separate one issue from the next. The typical commenter here does not possess that ability. “ Tens of thousands of Torah observant Jews thank the almighty for this day. The idea that Satmar Chassidus represents "authentic Judaism" or that Joel Teitelbaum brought such to America is laughable. What Teitelbaum brought to America was shtus and Apikorsus . I tell the story of the principal of Bais yaakov, complaining about RE tax bill in Sullivan County Town of Thompson. They responded, " do you know we spend $24,000 per student. He replied, I have over 2,000 girls in my school. 99.1% graduate on time. 99.8 % never get pregnant while in school. 67% go on to higher education or in medical related fields. It costs us only $5,700 per student. End of conversation. while Reb Aron is correct, it is the power of the purse that they understand. years ago, I forget whom, with similar disputes went to the BOE, and said" If you do not like how we do things we can just enroll 23,500 of our students in YOUR public schools. “ I tell the story of the principal of Bais yaakov, complaining about RE tax bill in Sullivan County Town of Thompson. They responded, " do you know we spend $24,000 per student. He replied, I have over 2,000 girls in my school. 99.1% graduate on time. 99.8 % never get pregnant while in school. 67% go on to higher education or in medical related fields. It costs us only $5,700 per student. End of conversation. A classic tricky yoni paulin saudi racist comment. Guess what yamsar, the typical commenter doesn't lie and fool other vin user by using ten screen names like you. Mr show off know it all yamsar a rotten scamer and a liar. Jewish education is the foundation of our lives. Ignorance, however, should not be a part of Jewish education. These children need to learn English; they need to learn math, and they need to learn enough science to be able to make their way in the world, without needing handouts! Insisting that children receive a basic education with certain minimal standards is not "interference into Judaism's core values!" Shnorring from the government, however, should conflict with our core values!! First of all, I am not Yoni. Secondly, I have read Ben Hecht, who showed his great loyalty to Yiddishkeit by marrying two Shiksas. I have also read Anna Porter (Kastzner's Train) and David Wyman (The Abandonment of the Jews). While Ben Hecht made some good points about the Zionist establishment, he was way off base about Kastzner. They will save money in the longrun by reducing public welfare benefits usage. Silly rebuttal to a book laden with documented facts and corrobated by Rabbi Weissmandel in his sefer ‘Min Hameitzar.’ Debate the facts not who Hecht married. “ A classic tricky yoni paulin saudi racist comment. Er.. it’s a bizarre accusation coming from you. I don’t know if all and that’s why I’m mostly quiet. You, on the other hand, posts your nonsense on almost every topic. Your ignorance particularly stands out when it comes to matters of Halacha and hashkafa, yet you post with confidence only a fool possesses. “ The Satmar war against education is an old story. So satmar eat treif, mechallel shabbos dont dont put tefillen etc etc . are desecrating all 613 mitzvos as opposed to you....What Judaism you practicing? like the new testament or deformed 'jews'who dont believe in relavation misini and a diety?